The frost is simply dazzling these days. Stretched out across the yard and far hills of moss like a sparkling net of stars. Lately, I’ve been mulling deeply into this time of cold winds and warm cheerful stoves. 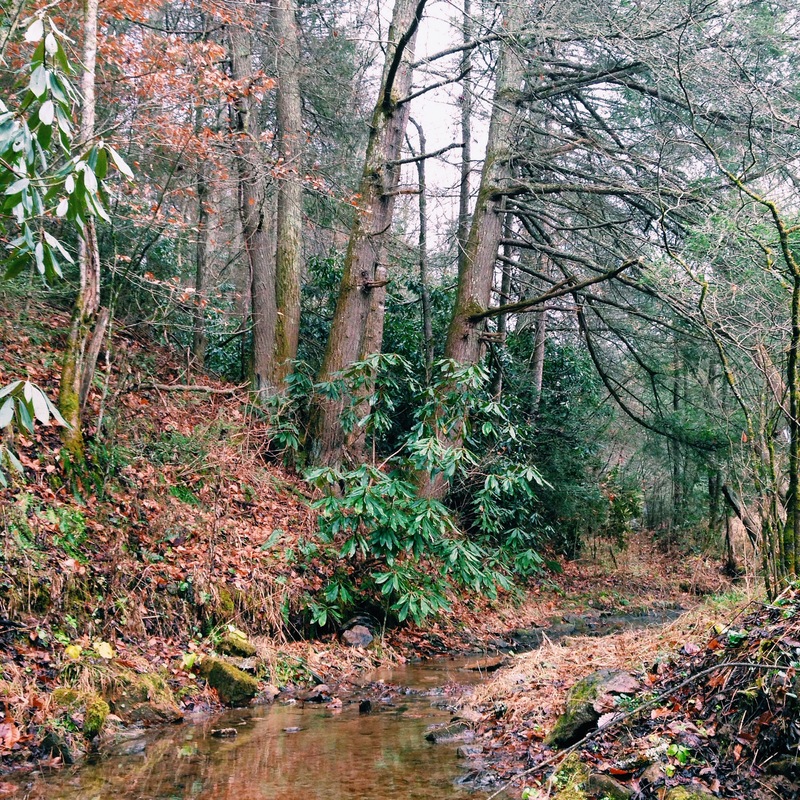 I recently moved into a new home far out in the hills and hollers of Appalachia and have found myself beginning each new day with such quiet appreciation — of the evergreens and rabbit tracks, silent does and rustic woolen clothes. I love this time of the year. When my breath begins to follow me around in little puffs of smoke and I’m allowed to simply stay inside with my cast irons and concoct. Between the rush of shipping medicine to every corner of the country, packaging blends for family and friends, and preparing for my Holiday magic + Medicine Making Class, I’ve been spending every other waking moment celebrating the season in the best room of any cozy cabin… the kitchen. There’s a certain kind of magic hour in my new kitchen. A mid-afternoon faery-spell when the sun pours in and kisses my suncatcher window with light. 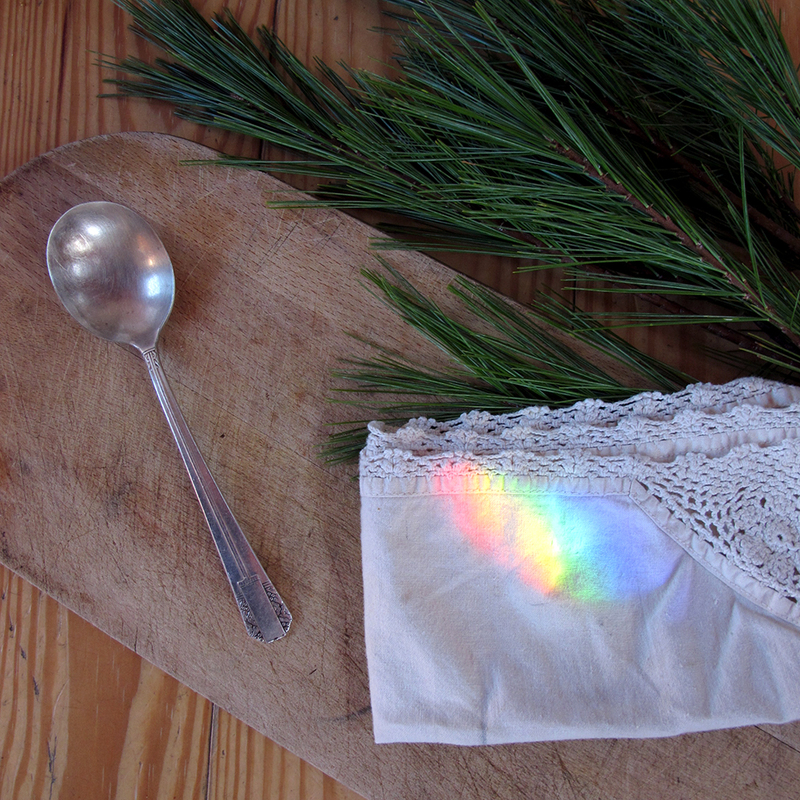 For an hour every winter-noon my kitchen is lost in a dazzle of winking rainbow-light. Scattered across the bare wood floors and walls, a small flock of color ripples from left to right, anointing every surface with a ethereal crystal, before they simply disappear, take flight. This is my absolute favorite time to create new magic. My good friend Juliet mentioned the idea of creating an adaptongenic sugar cookie a few months ago. At the time I thought, “By golly! What a fabulous idea!” Needless to say, the idea stuck to me like a burr to a gathering basket and I’ve been waiting until the holidays rolled around (aka. until it’s completely kosher to make…and eat…batch after batch of sugar cookies) to try it out. Now, I love snickerdoodles. Not just because they are a fun word to throw out at a party and pretend you speak fluent German (despite having some deep German ancestry, I can’t lay claim to knowing much at all of the language! Regardless, I’ve been “snickerdoodling” in a heavy German accent every chance I get), but because they are everything a holiday cookie should be: Soft, chewy, crispy, cinnamon-y and sweet. As much as I adore the holidays– with all their bright lights and white pines, warm cinnamon and cheer– they can also be (a tad) stressful. 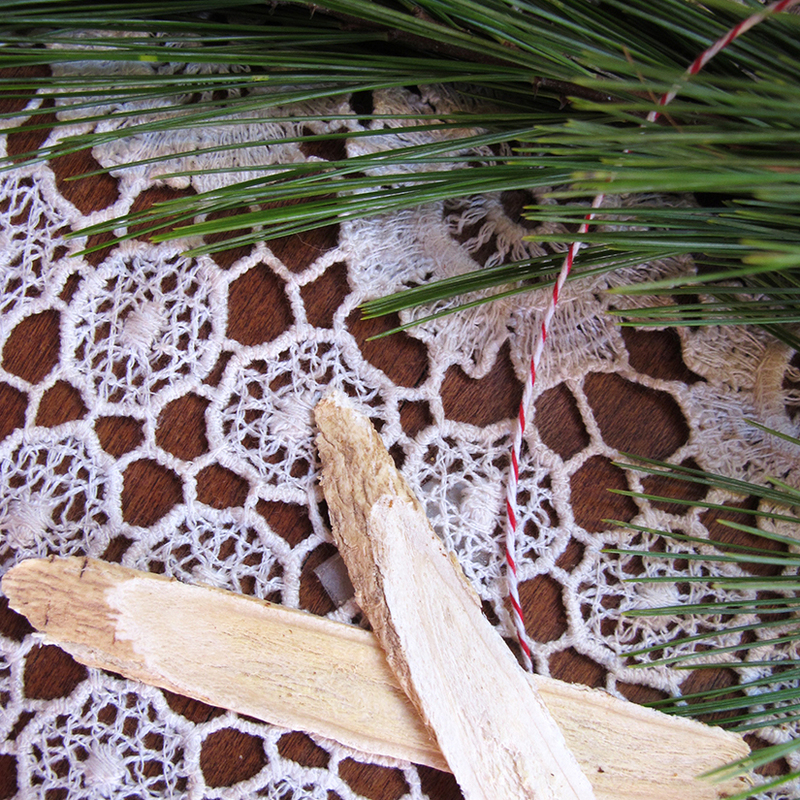 In the midst of a serious north pole whirlwind of holiday to-do’s, I was grateful for the chance to sit down and play with some of my favorite stress-relieving herbs (in cookie form, of course). Stress can come in lots of different guises– wintertime bugs and blues, an entire turkey to roast or a whole evening spent in itchy Christmas sweaters with your uncle Lou. Adaptogens, as defined by David Winston, are a kind of deep inner support, helping our bodies “adapt to stress, support normal metabolic processes and restore balance.” (If you are interested in learning more about adaptogens, definitely take a peek at David’s book Adaptogens). 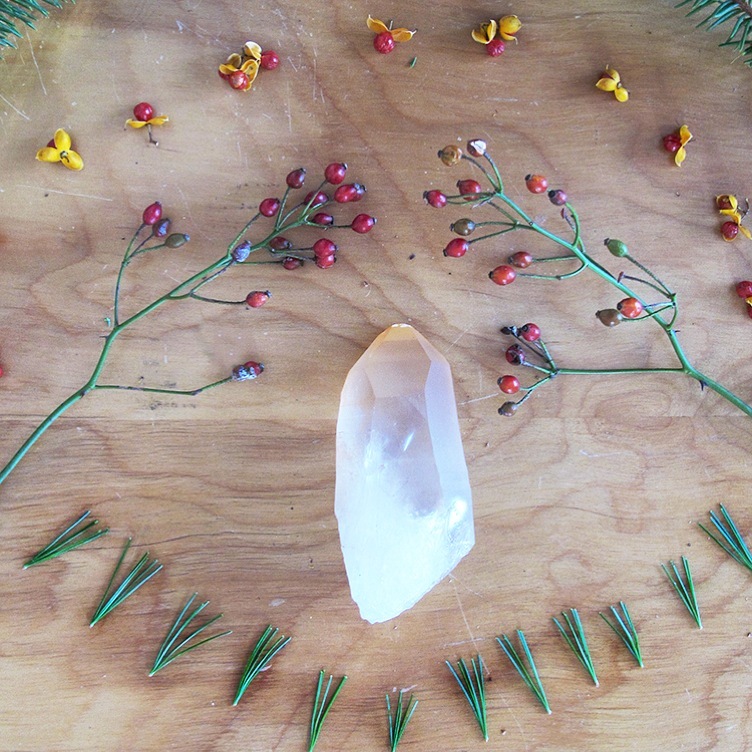 Often called rejuvenatives in other traditions, Adaptogens are herbs that help us to feel graceful, strong and energetic… no matter what stresses may be manifesting in our outward environment. 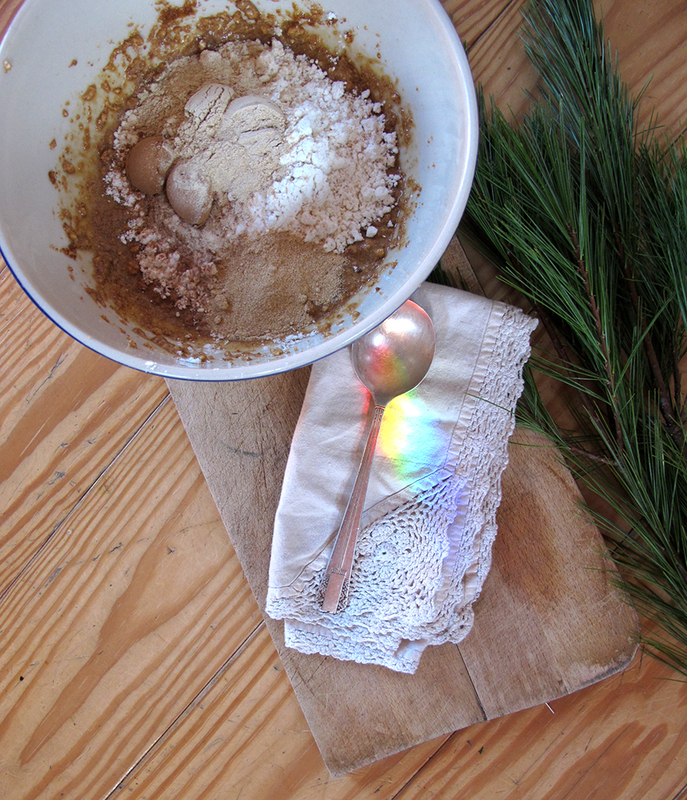 In this recipe I’ve included my three favorite adaptogens for coasting through the holiday season: Ginseng, Shatavari and Astragalus. One a sunny day, kitchen-rainbowed day this past weekend I put on my flowery apron, turned up some swinging holiday tunes, and got to creating this truly scrumptious batch of relaxing holiday cookies. 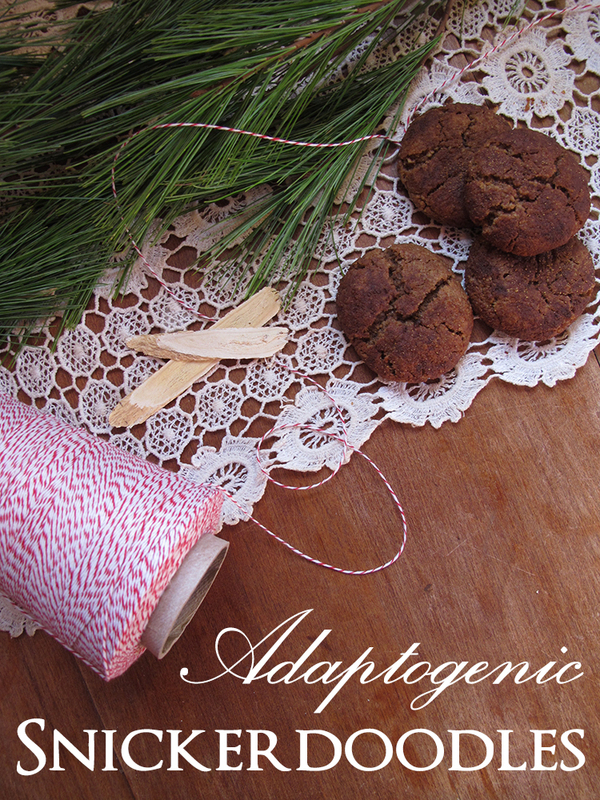 Crafted with three different adatopgens for stress-release, stamina and overall good cheer this holiday season, these Snickerdoodles are as rejuvenative as a hot evergreen bath at the end of a long day. Paleo, gluten-free, dairy-free, sugar-free and humbug-free, too! 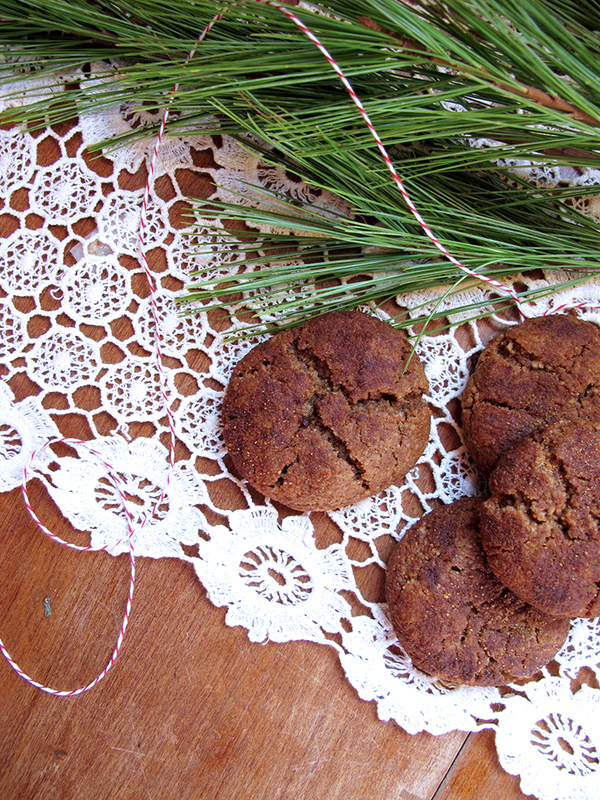 These rich cookies, sweetened with coconut sugar and dark amber maple syrup, are simply divine dipped into hot cocoa or paired with warmed apple brandy. Craft a batch for your next cookie swap or take the edge off a frenzied evening of present wrapping with these medicinal treats. 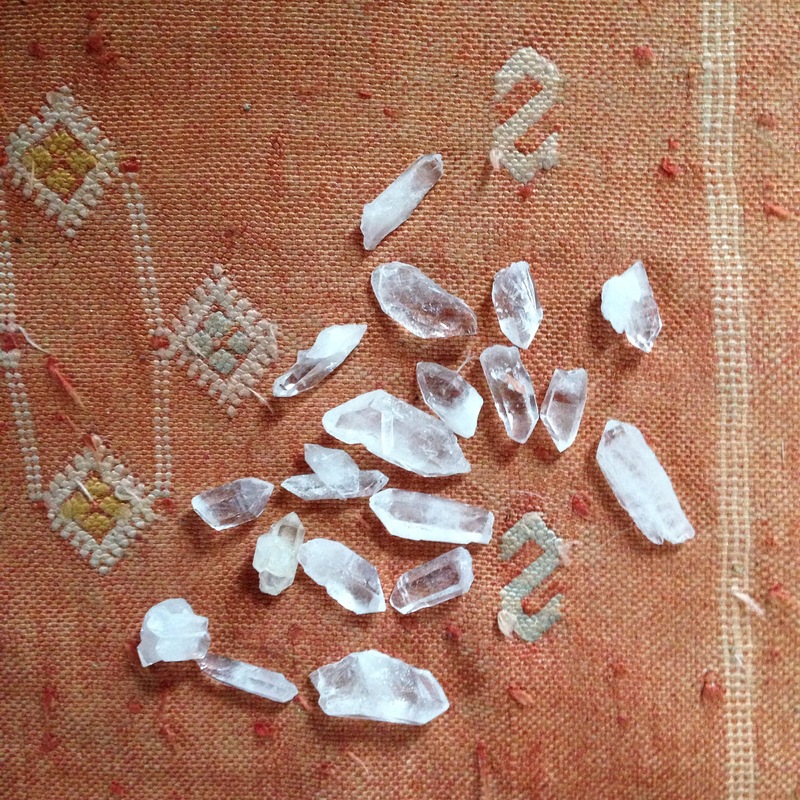 Dosage: 1-2… err 5 ? cookies (Take a load off, Mr. Claus). Let butter soften to room temperature. Using a mixer, beat together the butter, coconut sugar and maple syrup until creamy . Add in your egg, a dash of vanilla, and beat again until well mixed. Beat until mixture begins to ball up. Line your baking sheet with parchment paper. Using a spoon dole out large quarter-size semi-balls of cookie dough. They’ll be a bit sticky at this point. Place your cookie semi-balls on your baking sheet and refrigerator for at least an hour. 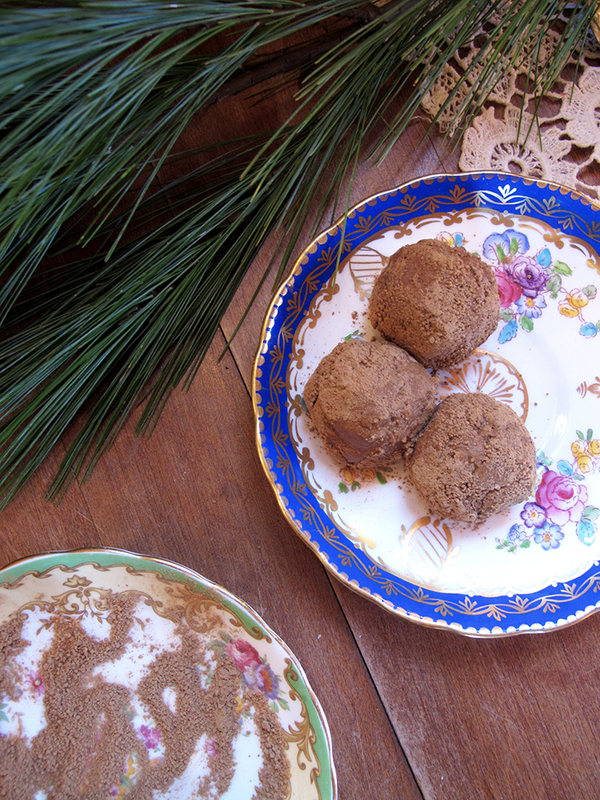 Pull out your snickerdoodle semi-balls when they are thoroughly chilled. Preheat your oven to 350 depress. Shape your snickerdoodles into orderly balls and finish by rolling them in the cinnamon/coconut sugar mixture. Place each ball back on your baking sheet and flatten slightly with a spoon. Bake for 8-10 minutes. They’ll still feel pretty soft when you remove them. Let them cool on the baking sheet for 5 minutes before transferring them to a wire rack to cool. Ginseng (Panax ginseng or P. quinquefolius) – Perhaps the best known adaptogen on earth, Ginseng is a mighty root with a long history of use in both Asia and America. A powerful tonic to increase long-term energy and resiliency, the entire plant was considered sacred by many indigenous people (including our local Cherokee). The forests in our native Appalachia used to be carpeted with Ginseng, but the popularity of this medicine (particularly in the East) has led to the widespread practice of ‘Sang hunting, virtually decimating our native populations. For this reason I highly suggest only buying ethically cultivated ginseng! According to David Winston, both ginseng root and leaf was employed as a ceremonial medicine and called upon to help improve hunting, provide protection, improve the chances of the love-lorn and enhance the power of other herbs. Modern scientific trials have found ginseng to be particularly helpful with those who experience adrenal exhaustion (most outwardly identifiable as dark circles under the eyes) and chronic fatigue. It helps reset our immune system and de-tangle an overly stressed nervous system. Ginseng is also known to be quite stimulating in the bedroom. How’s that for some holiday festivity, Santa baby? Shatavari (Asparagus racemosus)- An ancient Ayurvedic medicine, Shatavari has been in continuous usage for thousands of years. Known to help enhance physical strength and maintain youthfulness, Shatavari is considered a rasayana herb of longevity in Indian tradition. The name translates as “she who has a hundred husbands,” and thus has been used as an nourishing aphrodisiac and fertility enhancer for millennia. A wonderfully nutritive adatogpen, Shatavari root is particularly supportive for those with low appetite due to stress and chronic fatigue. Most commonly used today as a gentle hormone balancer, as well as mood regulator, Shatavari has a sweet and nutty taste that lends itself quite well to baked sugary goodies. Astragalus (Astragalus membranaceus)- Sweet, moistening and nourishing, astragalus is a wonderful immune tonic as well as adaptogen. A premier herb in traditional Chinese medicine, astragalus deepens our own roots, giving us a strong foundation of robust health as we enter the winter months. A tonic in all senses of the word, astragalus is best taken on a regular basis (an adaptogenic cookie a day keeps the doctor away!). This nutritive rotos works to strengthen the overall functioning of our immune system, so we are more resilient to all those common wintertime coughs and colds. A mild adaptogen, astragalus is my favorite tonic for nourishing a healthy disposition all winter long.